A damaged detective and a brutal serial killer collide in Steven Dunne’s nail-biting debut. DI Brook thought the nightmare was over – but the Reaper has left behind a horrifying legacy … A nail-shredding thriller for fans of Thomas Harris. 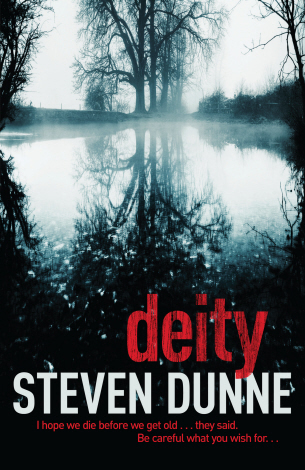 Combining intricate forensics with meticulous detection and the warped psychology of a psychopath, DEITY is a serial killer thriller of the highest order to rival the very best of Mark Billingham, Peter James and Peter Robinson. Steven’s latest thriller was published on July 4th, 2013 to critical acclaim. It was short-listed for the Midlands Book Award 2014, the region’s pre-eminent book awards. – you can order your copy from here. The fifth of Steven’s DI Brook novels is due to be published in hardback and as an audio book on May 7th, 2015. The paperback version will follow later in the year. Expect another edge-of-your-seat thriller, as Brook is confronted with kidnap and murder. 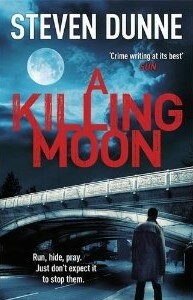 If you want to receive your copy on the day of publication, you can pre-order A Killing Moon on Amazon. DI Damen Brook is on a rare period of leave and determined to make the most of it by re-connecting with his daughter Terri. But with her heavy drinking proving a challenge, Brook takes the opportunity to visit a local murder scene when his help is requested. An elderly couple have each been executed with a single shot to the heart and the method echoes that of a middle-aged gay couple killed the previous month. Continue reading. A well written book with an excellent story. BUT You have to read past the excessive swearing in the first few chapters to really begin to enjoy it…..
Hi Paul. You’re talking about The Reaper, I think. Thank you for looking beyond the bad language. Sometimes in the quest for realism, an author has to write unpleasant things to present the characters naturalistically. On the plus side, the swearing quotient is much lower in subsequent books. Thank you for your nice comments. Hi Steve, I’ve just read The Reaper. It took me only 2 days because I couldn’t put the book down. I must admit that it is one of the best books I’ve ever read. The biggest advantage of this book is the fact that for sure it wasn’t predictable, even if I thought ‘ aha! he is the Reaper’ then there was a white-knucke twist of the action and the mystery was still unsolved and I was truly surprised by the ending. Hello Agnieszka in Poland. Nice to hear from you and glad you were so hooked by The Reaper. Is there a follow up book to The Disciple? It depends what you mean by follow-up but Deity is the next book in the series although it doesn’t pick up after The Disciple. Thanks for reading my work. I assume you enjoyed The Disciple. excellent books, well written, better if the person reading before me hasn’t added notation RE geographical errors. It’s just a book! The only problem is, after discovering your books via my mum getting one from the library and not reading it due to aforementioned language, I picked it up read it and now, you need to write faster! got through all your books in 4 weeks! Excellent Lee. Well my new Brook thriller is nearly ready to submit. It’s called Death Do Us Part and is scheduled for release next year. Just been introduced to your books and I’m absolutely loving the reaper so far. Im from Belper just outside Derby and it’s making it all far to real for me knowing exactly where everything is and how it looks, sending my imagination into overdrive. The door is definitely locked whilst reading lol can’t wait to read more of your stuff. I’m searching for some ‘Death Do Us Part’ dates for book signings in 2016 – and all I’ve found is Nottingham. Any more due? There will be a whole slew of signings for the paperback release from the end of August and through September. Hope to see you at one of those. Well .. what a GAIN!! I couldn’t put it down, and now have all (with the exception of “Death us do Part”, which I’m just off to Amazon to buy). Thank you for those very kind remarks and sorry for the tardy reply. I’m insanely busy at the moment with the release of Brook 6, Death Do Us Part. But so glad you enjoy my work. Excellent. I have finished the series. Anymore in the pipeline or should I find another D.I. Hi Angela. Sorry to reply so late but I’ve been immersed in trying to finish my latest book, The Resurrection, and without a publishing deal in the works, I’m having to do it without a deadline. I’ve now sent The Resurrection to my agent so fingers crossed for a publishing contract and a new DI Brook novel for 2019. Merry Christmas. I think I’m a latecomer to the novels but I’ve devoured them all. Love them! I’ve read many crime/thriller series from many great authors but this has been my favourite series and is right alongside John Connolly and Stuart MacBride. Great writing, great plots, fantastic characters and brilliant twists. Any sign of a seventh book in the series? Hi Andrew. Thanks for getting in touch and sorry for the late reply. I have actually been immersed in trying to write No. 7 and have only just completed it though I don’t have a publisher for it yet. Writing without a deadline means things inevitably take longer but there it is. The Resurrection is finished and is the final part of the Reaper trilogy, following on from The Disciple and I hope to be able to release it in 2019, depending on my agent. Thank you so much for those very flattering comparisons with other great writers. I hope I can sell as many copies of my books as they do theirs. Here’s hoping. Merry Christmas and please spread the word about my series. Hi Steven, I work for 2 of my local library services and I’m a huge crime fiction listener (I prefer audio as I don’t ever have to put the ‘book’ down. I love finding such great quality novels from lesser known authors than Mark Billingham and Peter Robinson et al. Your novels really are first rate, although I still can’t get ‘The Reaper’ on audio I love the books so much I’ve just ordered a paperback copy. I’m busy recommending your books to all our borrowers safe in the knowledge that they will really enjoy them. Keep them coming, thank you. Hi Steven, wow, that’s wonderful news, I’ll keep a keen eye out for number 3, can’t wait to either read or listen to it. 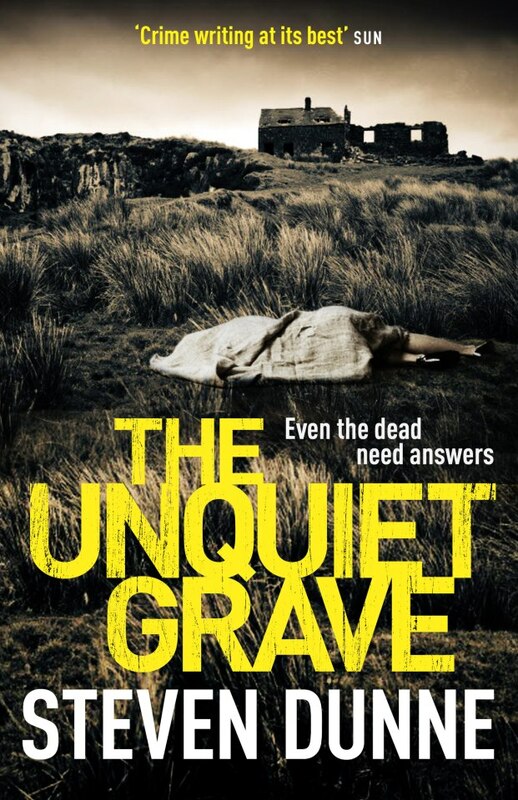 I work for both Rhondda Cynon Taf and Caerphilly Library Services in South Wales…and crime fiction is certainly very much alive and well in the South Wales valleys. Have a wonderful Christmas and thank you again for producing such enjoyable books. Hi Phil. Thanks for getting in touch and for those lovely comments about my work. I’m so glad you like it. Please spread the word as I’m out of contract at the moment so the more people reading and talking about my work the better. And I’m pleased I’m able to bring the county and the city of Derby to life for you. I try very hard to make sure the locations are almost like an extra character. Merry Christmas to you and yours.